Despite what the marketing might indicate, the latest Disney animation is all about a princess (not a goofy-looking snowman). Like their previous fairy tale, Tangled (2010), which told the story of Rapunzel, this loose adaptation of Hans Christian Andersen’s The Snow Queen has been rebranded with another gender-neutral adjective, presumably in order to lure in princess-averse boys. Here’s hoping that this strategy works, because Frozen is a delight, giving us the two best Disney princesses to date, joining Katniss Everdeen as some of the best female protagonists in recent years. Frozen is certainly an apt title. Elsa (Idina Menzel) and Anna (Kristen Bell) are two princess sisters in a Scandinavia-like kingdom named Arendelle. Elsa possesses powers which allow her to conjure ice and snow, much to the delight of the younger Anna, but due to an accident in which Anna is harmed, Elsa is kept in isolation until she is able to control her ability. As a result, the sisters grow apart into adulthood, until their parents’ untimely deaths mean that Elsa must become queen. Overwhelmed by nerves, grief and the prospect that her powers will be discovered, Elsa loses control and freezes the whole kingdom before fleeing in shame. It is then up to Anna to find and reconcile with her sister to persuade her to thaw the kingdom before its citizens freeze to death. While the concept seems simple enough, like all Disney fairy tales it is not complete without a healthy smattering of musical numbers to help advance the narrative. The songs in Frozen are almost as good as anything from Disney masterpieces like Beauty and the Beast (1991), and are combined with spectacular 3D animation to produce breath-taking sequences. While there are some awkward lyrics - “Who knew we owned a thousand salad plates?” - some of the songs also display comedy genius. This is unsurprising given that they were penned partly by Robert Lopez, the lyricist behind comedy-musicals Avenue Q and The Book of Mormon. The most memorable song in this respect is ‘In Summer’ sung by Olaf (Josh Gad) the naïve snowman, who has never experienced heat but is sure that he is going to love it. The real showstopper, however, is Elsa’s ‘Let It Go’ which, as well as being the best, most emotional and visually spectacular song, also has the achievement of showing (perhaps for the first time in a Disney animated film) a non-villainous female revelling in the joy of using her magical powers, and discovering her identity in the process. This revisionist aspect is the most interesting part of Frozen, and will be explored further in my Alternate Take. Furthermore, Frozen is the first Disney animated film to feature two women in lead roles in which neither is an antagonist. Despite this, the film initially feels very much like it will pan out in a typical fairy tale fashion that we have come to expect, especially when we learn that to save the day they will need - what else? - an act of true love (cue eye-roll). However, this is a film which is very much aware of its predecessors, and does not necessarily tread the expected path - and what a relief that is. 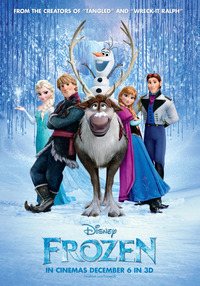 While it is full of the charm, delight, and humour that makes the best Disney films so irresistible, Frozen takes leaps and bounds in terms of story, female characters, and well-worn tropes such as the notion of ‘true love’, and it even puts an interesting twist on the ‘talking animal’ motif. With the exception of a rather unconvincing villain and a character whose only purpose seems to be to act as a red-herring, Frozen is a touching, hilarious, and beautifully animated story that succeeds in revising what we think of as a ‘Disney princess film’. This review was published on December 21, 2013.